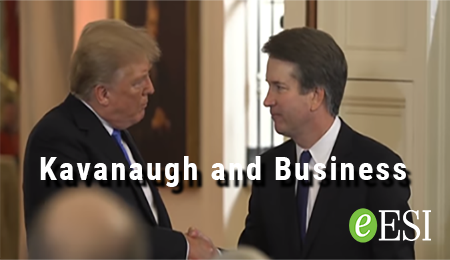 Brett Kavanaugh and business - eEmployers Solutions, Inc.
With so much national attention focused on Brett Kavanaugh’s confirmation hearings, we wanted to take a moment to consider what the effect of his nomination to the Supreme Court might mean for small business should he eventually be confirmed. When Kavanaugh was nominated to fill the open position on the U.S. Supreme Court in July, the USA Herald‘s Charles Laverty called it a victory for small business. But others are unsure about what a Kavanaugh nomination will mean. While some commentators focus on his past court decisions that sought to limit the reach of government agencies, others find him to be soft on issues that affect the cost of doing business. While we wait to see what next week’s hearings reveal about Kavanaugh’s prospects, let’s take a look at what some of those commentators had to say. In How Has High-Court Nominee Brett Kavanaugh Ruled on Workplace Issues?, SHRM‘s Lisa Nagele-Piazza investigates how Kavanaugh’s approach to interpreting the U.S. Constitution might impact his decisions in the employment and labor cases that make it to the Supreme Court. Employment attorneys and union representatives that Nagele-Piazza interviewed say that Kavanaugh’s past employment-related rulings have been moderate. However, his strict constructionist view of the Constitution results in a tendency to narrowly construe labor laws. This tendency to avoid permitting expansion of existing laws by agency actions makes some union leadership uneasy, but would be welcomed by business owners. Regarding Title VII Civil Rights cases, Nagele-Piazza notes that Kavanaugh has issued rulings that are more liberal than some of his contemporaries on the bench. So, perhaps deciding whether Kavanaugh is conservative, liberal or neutral may depend on one’s point of view – on this point, the jury is out. What did financial pundits have to say about Kavanagh’s nomination? What is the general consensus among business owners and commentators? Kavanaugh may be willing to stand up against discrimination in the workplace but is less inclined to rule in favor of agency-level regulations. If he is successful in his bid to join the Supreme Court, Congress may have to begin passing legislation to support those administrative rules if they want to remain in place. What do you think about today’s regulatory environment for small business? Would a rollback of federal agencies’ authority be good for you? If Kavanaugh is confirmed, we may get a chance to find out.